Seattle and Sky Blue have each played the fewest matches to this date in the 2018 NWSL regular season. The Seattle Reign FC and Sky Blue FC are lagging behind the rest of the National Women's Soccer League in the number of games they have played. While the Chicago Red Stars have completed a full third of their slate with eight games played, Seattle has played five while New Jersey is stuck with just four matches played. They will have to make up lost ground on the pitch over the next few months, which could be difficult on the players as we move into the dog days of summer. Seattle, despite their limited schedule, has had a great start to the season. They sit near the top of the standings with a record of 3W-1D-1L. The only loss came on a short week on the road when they faced the North Carolina Courage. That 1-0 loss was also the only game in which Seattle did not score. Last weekend the Reign played in Portland and knocked off the Portland Thorns FC in a 3-2 barnburner. Sky Blue has been less fortunate early in the season. New head coach Denise Reddy added midfielder Carli Lloyd but at the expense of forward Sam Kerr. Without Kerr's finishing talents Sky Blue is struggling to find an identity, and the lack of game action together certainly hasn't helped. They are the only team in the league without a win and sit at the bottom of the league standings. Fortunately, there is still time to turn things around with just four games played. Sky Blue was beaten 3-2 last weekend when they faced off against the Houston Dash. 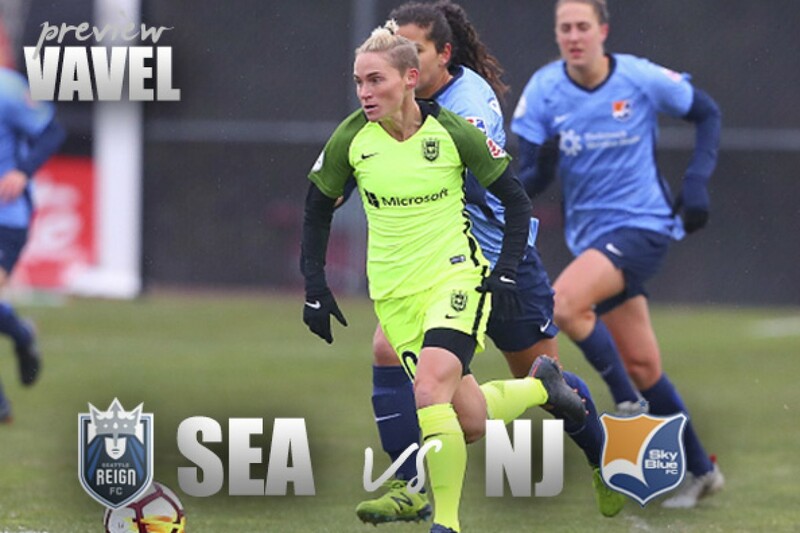 The two teams faced off on Sunday, April 15 in New Jersey where the Reign came away with a 1-0 victory. The game was played in miserable conditions, and the only goal of the match came on a sixth-minute Megan Rapinoe penalty kick. The Reign were awarded a second penalty attempt later in the match, but Jodie Taylor was unable to convert. Apart from the two penalties, the game was pretty paltry on both sides. Sky Blue managed just four shots in the pouring rain with one on goal, and rookie Savannah McCaskill was shown a yellow card. That performance was an appropriate embodiment of how Sky Blue has performed to this point in the season. For the Reign, it was great to get a win on the scoresheet, but they suffered a huge loss at the same time. Midfielder Megan Rapinoe suffered a hamstring injury that would keep her out of the next few matches, including the 1-0 loss in their following game to the Courage. Rapinoe has not played in a match since that game, but she is off the injury report and is likely to see at least some game time today. The Reign are very difficult to take down at home and they have a clear talent and chemistry advantage at this point in the season over Sky Blue. While New Jersey finally found a scoring touch last week, the defense is still questionable and they are facing off against one of the offensive powerhouses of the league. The Seattle defense has been nothing to write home about this season either, and these two teams have a history of playing in shootouts after two of their 2017 meetings ended in 5-4 scorelines. With Rapinoe hopefully getting a few minutes for Seattle and the way both defenses have played, Seattle seems to have a clear advantage. The game will be broadcast on Go90.com and the Go90 app. Kickoff is scheduled for 10:00 pm ET.